Usually paired with a deaerator to provide additional condensate storage capacity when operating conditions cause a sudden surge of condensate return that would otherwise overwhelm the storage capacity of the DA and be lost through the overflow to the drain. Our Surge Tanks are essentially CF packages without the preheater. 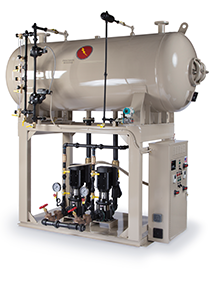 Precision surge tanks are pre-mounted, piped, and wired condensate receiving storage tanks, with a float activated make-up water valve that adds fresh water to replace condensate lost through the steam loop to maintain sufficient water level inside the tank.